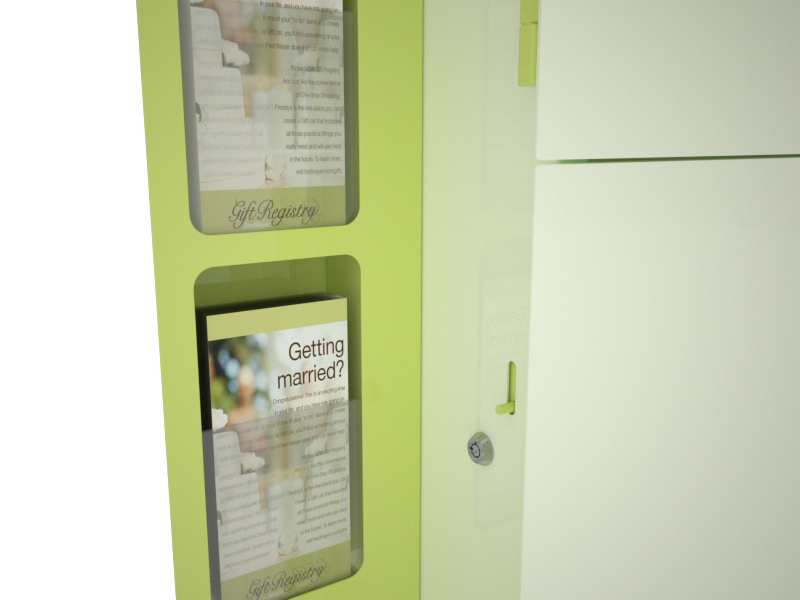 Sometimes a kiosk is a lot more than just a kiosk; it becomes a destination. Olea’s experiences in industries other than the kiosk industry really shine through when these types of things are asked of us. Since we have such an overly qualified team of designers, engineers, and craftsmen, we make it possible for our customers to create any design they can imagine, fully knowing that we will be able to build it. 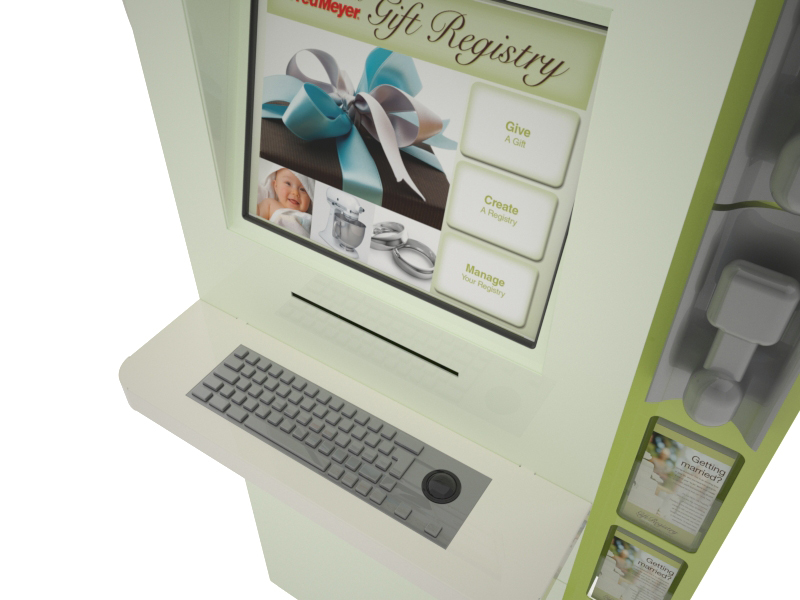 With this in mind, it’s easy to see why Fred Meyer chose Olea to build their kiosks! Fred Meyer is an all-inclusive retail store with over 200 locations in the Portland and Seattle areas. 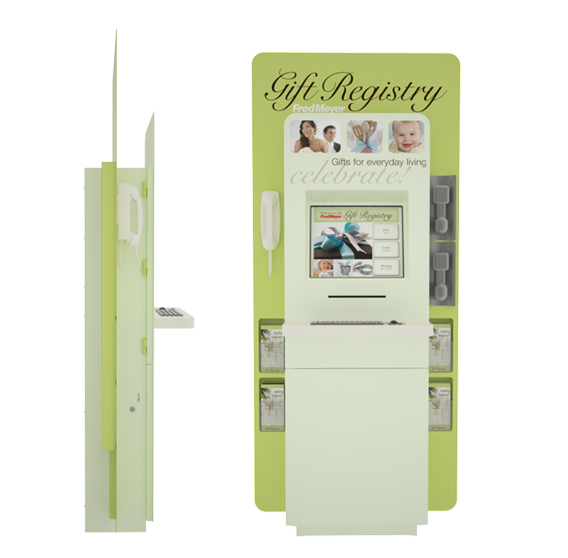 They started the project to create gift registry kiosks that would go into their stores to help expecting mothers or engaged couples to create wish lists for the Fred Meyer stores that are easily accessible to their friends and family. 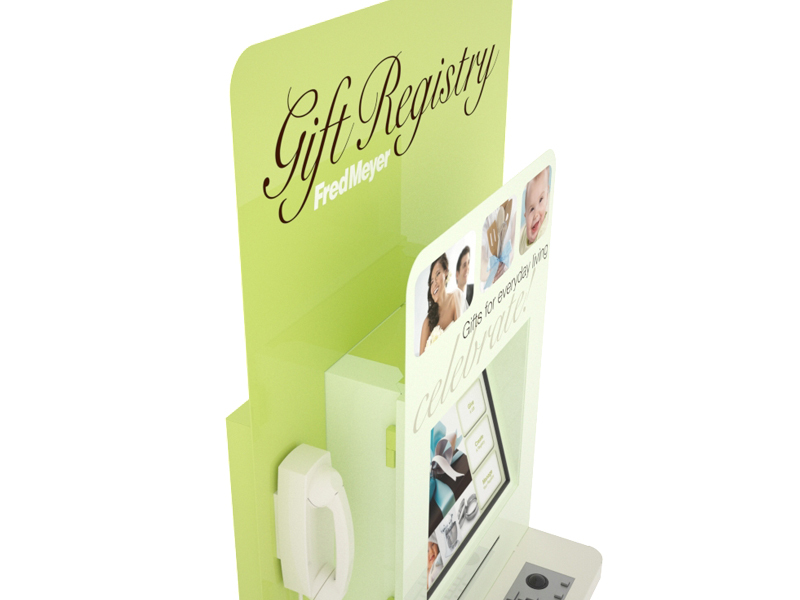 The Fred Meyer gift registry kiosk was a job we won simply because our design beat out the competition, even though we were competing in design and price. 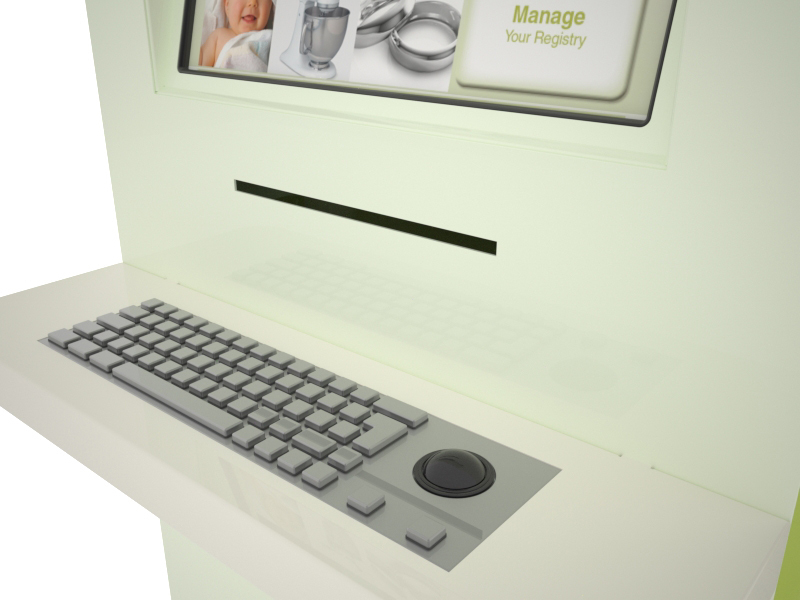 Originally the kiosk design was supposed to include a Corian counter and a stool that was supposed to be bolted down to the floor. This was because Fred Meyer wanted it to become a destination, where you spent time organizing or searching through products with the help of a store attendant that knew about them. Eventually, once we got started on the job, they decided that it would be better if they instead included two portable Motorola barcode scanners that unlocked from the unit so they could go around and view the products in person in order to decide whether or not they wanted to add it to their lists. The barcode scanners unlock once the user creates an account with the store. The kiosks not only had to be convenient for the customers, but also for Fred Meyer. In order to do this, we designed the unit to have no base plate, so it was bolted to the ground instead and had a minimal footprint on their floors. Furthermore, all aspects of the machine can be serviced from the front side, so maintenance is efficient and easy, and downtime is kept to a minimum. The unit also fits in perfectly at their locations, including the same color scheme and photos displayed throughout the stores. 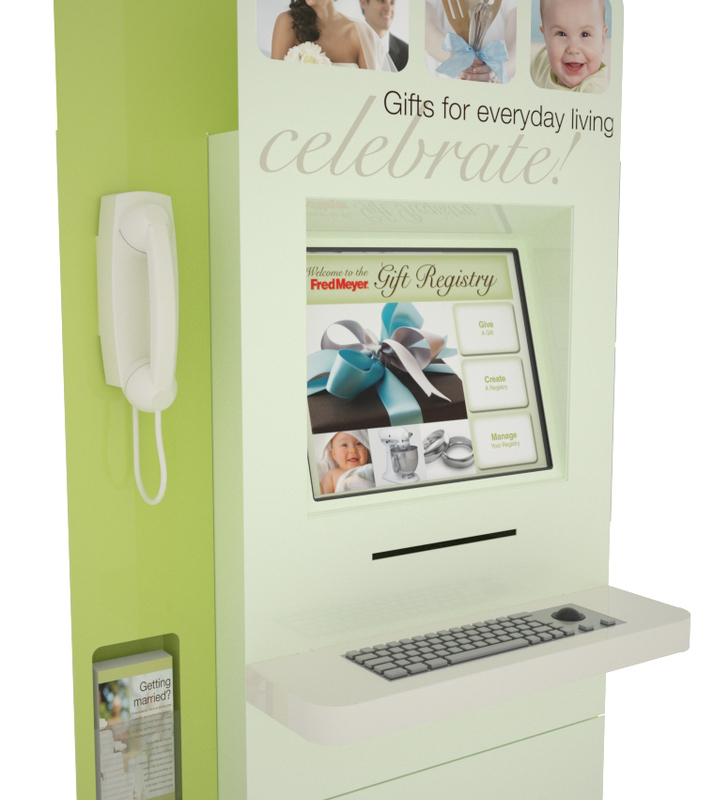 The kiosk is equipped with a 19” touchscreen monitor, a printer to print out the wish lists for guests, and several locations to store brochures about the gift registry program. 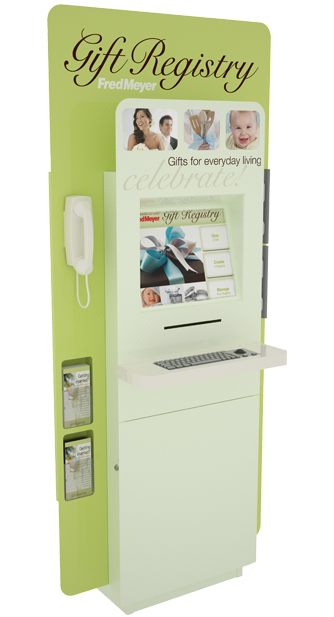 It also has a phone in case you need to call a representative to the kiosk at anytime. Projects like this where Olea can really test our boundaries and create something truly unique are why we love being in the kiosk industry. There are very few companies in the world that can take your most complex ideas and make them a reality, and Olea just happens to be one of them.